Why am I the only person in this family who ever throws anything out? 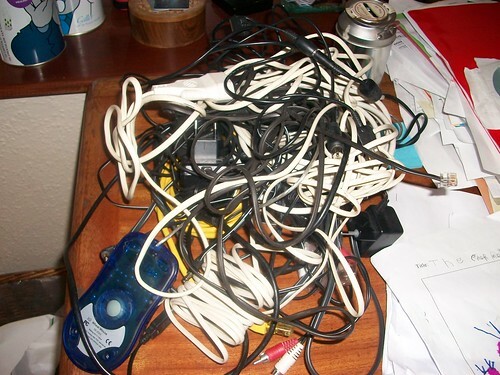 Following a late night search for my phone charger, this pile was left for Mr. Waffle one morning along with a tart note saying 1) I was going to throw them out unless he mounted a very convincing defence and 2) did he have any idea where my mobile phone charger might be? He confessed that he had “misfiled” my phone charger in the drawer with his – where it is easily found, being apart from the big box of wires we are not allowed to throw out (including, until recently, Air Canada headphones purchased on a transatlantic flight about ten years ago – never used since that initial trip). Is it my fault for buying a big box where all these things could co-exist in harmony and develop their own ecosystem?